Before the computer and internet days there was a lady born in Buffalo New York in 1887 named, Lutie WETHY. As a single lady, she and her sister , Marjorie, [sometimes Margaret,] moved to Washington, DC., during World War I, to work for the U.S. Government, and they are found there still on the 1920 census. 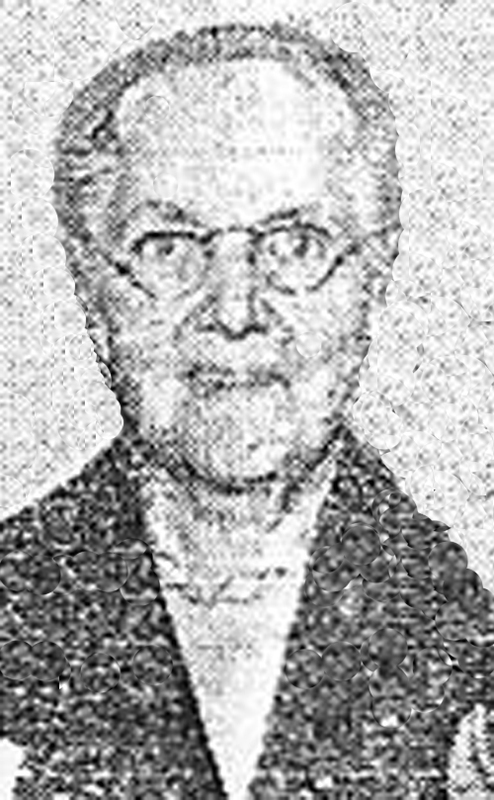 Lutie married Thomas J. FOLEY in 1925 and afterward most often used her likely middle name of “Janet” Wethy FOLEY. Janet was the given name of her Scottish maternal grandmother, Janet DUNCAN, who had resided with the WETHY family for some years. “Akron is only our post office address. We do not live there. Our home is on Route # 5, the main highway across New York State from Albany to Buffalo, 25 miles east of Buffalo and 15 miles west of Batavia. 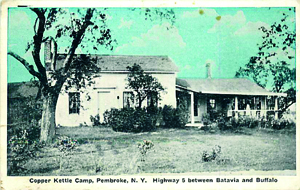 Janet and Tom operated this property, “The Copper Kettle”. as a “Tourist Camp” meaning they had cabins for travelers and are so listed on the 1930 census. The house in the postcard photo shown below is now gone and has been replaced by a brick home. I talked to one local resident of Pembroke and they recalled that remains of the cabins could be seen just a few years ago. As I was searching census records on these people I found Janet listed as “Lutie W. Foley” on the 1930 census in Pembroke, Genesee co., NY., and while reading the page was slightly annoyed by the backwards flourish script of the enumerator which took a few seconds to try to decipher, and then found myself grinning openly when I read that Lutie Wethy Foley was the 1930 census enumerator! Janet was also a constant speaker and lecturer at many different social groups, historical societies, DAR meetings, village and town celebrations and there are many newspaper announcements that are easily located in various digitized newspaper websites online. The following are just a few of the dozens of newspaper announcements that I read in preparing this article. “This column is being published to help American families to learn about their forefathers. Is it helpful to you? Have you looked in vain for your family name? There is just one way that the editor can help you. Tell him what you want. Send a question. No one can tell how far this paper will go, nor who will read it. Someone may know the answer and solve your problem. Searching family records requires time and money, but is so worth while. Just now your own paper offers you a valuable service at no expense. Take advantage while you may. Who met her death with no surprise, Jan 3, 1795. Aged 65 years. N.B – Her son Caleb, by a tender regard, has caused this stone to be erected here”. Mrs FOLEY admitted another strange-sounding hobby; searching ancient birth and death certificates in old buildings, trunks and churches. It is of course, a form of genealogical research, but it brings richer rewards, she insists, than using the usual method of research: library study. ‘The sad truth is that most families either do not maintain thorough records of their forefathers or they keep none at all’. 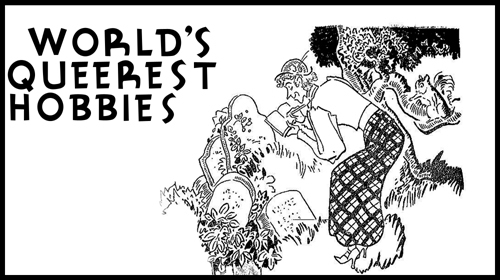 Mrs. FOLEY is exceedingly adept at finding old maps of cemeteries and in deciphering them. She has two interesting specimens. One, more than 100 years old, was made of paper and pasted on an old piece of calico. Through the years even the calico got frayed and wore out almost completely. A member of an old Western New York family whose hobby has become a life work was in Niagara Falls yesterday afternoon in conjunction with the meeting here of the National Society of New England Women. Mrs. Janet Wethy FOLEY, of Akron, NY., who makes a business of searching old New York state church records and looking up ancestors for those who want to know something about their families, was on hand at the registration desk in the mezzanine of the Hotel Niagara to give information to interested members. 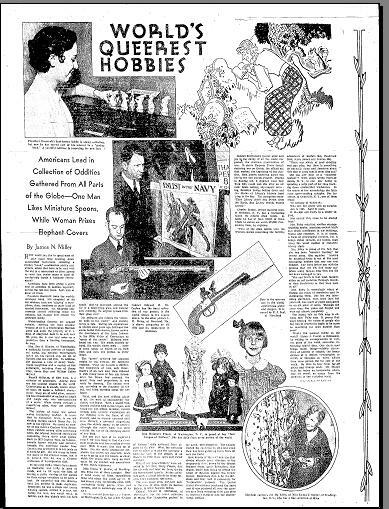 Mrs. FOLEY, who with her husband, Thomas J. FOLEY, has been engaged in this unusual occupation for the past six years, compiles a monthly magazine embodying the results of their researches. These are distributed to libraries and to interested individuals. It all started, Mrs. FOLEY explained, when she wanted to find something about her own ancestors and discovered that vital statistics were non-existent in this state before 1880. That led to a search of church records and since then she and her husband have gone into such study professionally. Many records which would otherwise be lost beyond all recall have been unearthed in the process., Mrs. FOLEY declared. In her magazine, these names are printed as they are found in the baptismal, marriage and funeral records of the churches, many of which have been out of formal existence for many years. Most valuable feature of their studies, she said, has been to inspire custodians of such records to improve and preserve these valuable files and to search out others. Asked why she had not added photography to her method of study, Mrs. FOLEY admitted that it was chiefly because neither she, nor her husband knew much about cameras. Albany, NY – Local historians are invited to join the recently formed New York State Association of County Historians, State Historian Albert R. COREY announced. Membership is open to all county and city historians and to town and village historians upon recommendation of their respective county historians. Isaac McWITHEY/McWETHEY of Granville, Washington Co., NY., married Polly MILLER. 34 Lyth Ave. 34 Lyth Ave. Witness: Marjorie J. SCHAEFER, Salamanca, NY. East Pembroke, March 7, – Thomas J. FOLEY, 55, of East Pembroke, died at 11:10 o’clock Saturday morning (March 5, 1949) at St. Jerome’s Hospital in Batavia where he had been a patient for a month. Mr. FOLEY was born on December 18, 1893 in Melrose, Mass., a son of the late Mr. and Mrs. Thomas FOLEY. He spent his life in genealogical research and had recently been associated with the Farrel, Birmingham Company in Buffalo. Surviving is his wife, Mrs. Janet Wethy FOLEY, the County Historian. “Mrs. Thomas J. FOLEY, 74, of 100 Summit St., widow of Thomas J. FOLEY, died Monday evening (Jan 8, 1962) at Buffalo General Hospital after an illness of several months. Mrs. FOLEY was born in Buffalo, the daughter of the late Frank E. and Margaret J. DUNCAN WETHY. She was a member of the First Baptist Church. Mrs. FOLEY was prominent in activities of the Holland Purchase Historical Society, of which she was past president. 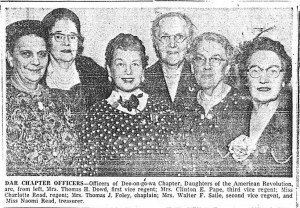 She also was active in Deo-on-go-wa Chapter, Daughters of the American Revolution. For several years she led DAR-sponsored programs for new citizens during naturalization court sessions. She also conducted bus tours to points of historical interest. “Friends of the Late Mrs. Thomas J. FOLEY of 100 Summit St., widow of Thomas J. FOLEY, may call at the H.E. Turner & Co., Inc. Mortuary until noon Thursday. Services will be conducted by the Rev. Carl J. Spieker, associate pastor of the First Baptist Church, of which Mrs. FOLEY was a member at 2 pm Thursday at the church. Interment will be in Forest Lawn Cemetery. Born in Buffalo, Mrs. FOLEY received her education at Miss Nardin’s academy, Public School 17 and Masten Park High School in that city. 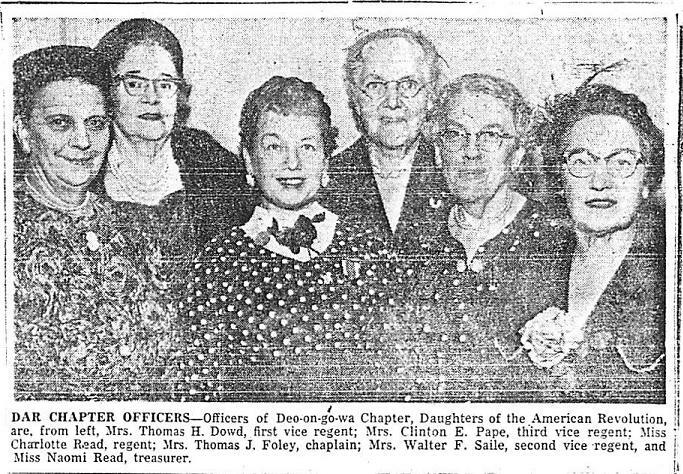 She was a past Regent Daughter of the American Revolution, past president of the Holland Purchase Historical Society, former Genesee County Historian and a member of the Genesee Memorial Hospital Auxiliary, the YWCA and its newcomer Club, the Federation of Women’s Republican Clubs of New York State, the State Button Society and was active in other charitable organizations. Floral tributes included those from the YWCA Newcomers Club, Deo-on-gowa Chapter, DAR, First Baptist Church, Philathea Class of the East Pembroke Baptist Church and the Holland Purchase Historical Society. 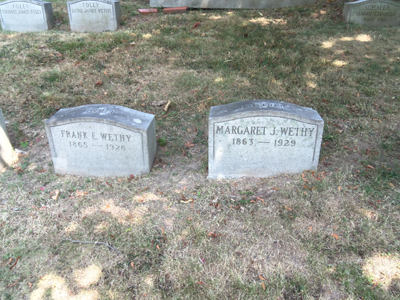 Wethy Family Plot, Forest Lawn Cemetery, Buffalo, NY., Section 26, Lot# 42. 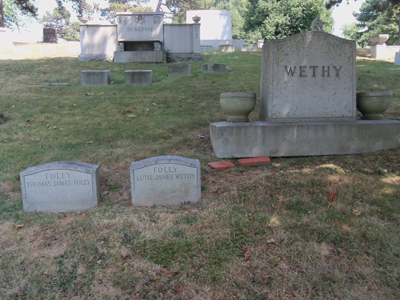 Janet Wethy FOLEY and Thomas James FOLEY Gravestones – Forest Lawn Cemetery, Buffalo, NY. Lutie Janet's Parents Gravestones – Forest Lawn Cemetery, Buffalo, NY. So fellow readers of the Upstate New York Genealogy Blog, you may feel comfort in knowing that your queer hobby has grown slightly since the 1930′s. This article is my tribute to a relatively unsung hero of genealogists everywhere that have ancestors from New York State. There are hundreds of articles in “Early Settlers of New York State” that will provide clues to your ancestors from areas all around New York State. It appears as though Janet and Tom must have taken research trips all throughout the western parts of the state as well as the Mohawk Valley region and many parts up and down the Hudson River Valley. Unfortunately the original source documents are not described as to location and condition, but you as a genealogical researcher ought to be able to track them down for your own citations. 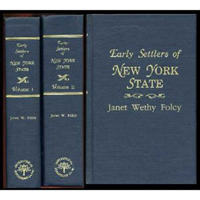 Readers that might want to purchase “Early Settlers of New York State” will find the reprint of the two volume set available at the Genealogical Publishing Company www.genealogical.com. It is also offered as a CD-ROM version which is rather a nice feature to have at your fingertips, as it is all word searchable. You will also find used copies from time to time on eBay, ABEBooks.com and Amazon.com. The original serial sets are rather scarce and hard to find. Mary Kay Wright, Western NY Genealogical Society volunteer at the Grosvenor Room of the Buffalo and Erie County Public Library. Cynthia Van Ness, Buffalo & Erie County Historical Society . 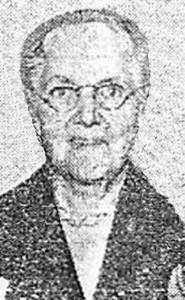 Carol Heffley, Daughters of the American Revolution member. Staff at Buffalo and Erie County Public Library. Staff at Forest Lawn Cemetery, Buffalo, NY. Judy Stile, Research Assistant, Genesee County Historian’s Office. ps: If anyone has any idea as to where Janet and Tom’s original source records are located it would be great fun to investigate. Do You Ever Think About the Printed Sources Sources? You know the drill by now. You find something on your ancestors in an old book and you are on Cloud 9 because now you have something factual to go on, it is in a book! Well do you ever consider the source of that printed source? Do you ever wonder, “Gee I wonder how he knew that?” Well it would be good to think about the sources that were available to the writer at the time the book or other printed source was written. I thank my lucky stars every time I find an entry in an old county history because it gives me a little platform to launch a new research project, or might provide clues that will send me off to search in greener pastures. Most of the men and women that compiled those huge old county history books were nuts just like you and me and they had a story to tell that they thought was interesting enough to share with everyone. Think about the time period that the author lived in and what was their background and why would they write it. Many of these big old books were published from about the 1850′s through about the start of World War I, with the largest majority coming to print soon after the Centennial of 1876 which I believe created an interest in the founders of this country over the previous 100 years. I have a picture in my mind of one of these compilers having boxes and scrapbooks of old documents and newspaper clippings and journals and perhaps albums of photos or sketches that related to the early history of their community. Chances are they knew other people in their area that had similar collections and liked to swap yarns so I envision many letters back and forth. So lets say an author is about 50 or 60 years old when they get bit by the bug that says ‘better leave a trail’. They can remember back 40 to 50 years and they know what their parents told them growing up and they can go and interview the older people still living in the area. These things were their sources right? They had few books that they could refer to for sources other than natural history books, gazetteers and possibly an earlier publication on the same subject that might have been released a generation or two previous. They did not have Google, Ancestry.com, Rootsweb or any of the multitude of databases that you have right at your fingertips. They wrote history the old fashioned way, they did historical research in old record collections and they served up countless memories from various sources. The point here is to not take anything too seriously that is found in print in any of these old publications, but by all means do not discount them or bypass them! By being able to prove, or disprove, any of these printed words using modern research methods or to at least build a strong case for a new hypothesis will afford you countless hours of pleasant research and a much stronger affinity to those that signed their name on the dotted manuscript say a hundred or more years ago. In the future I plan on bringing you some stories about my favorite historians and why I want them to come back and do it all over again, this time with a computer.